The original word for "nomad" came from a word for felt, making the nomads "felt people". These felt people called their circular, lattice-walled shelters "home," ger (rhymes with "air") or uy (oo-ee). But apparently these nomads liked the efficiency of the Yurt, one of many options I explore tonight in a quest for six months' worth of Ozarks-suitable camping shelter (Spring to Fall Solstices...). No Flood worries here! Ha! Then again, a few feet of snow and I'm ... "floating"... on high cotton! HAR! The message, really, is-- folks, anything is possible. 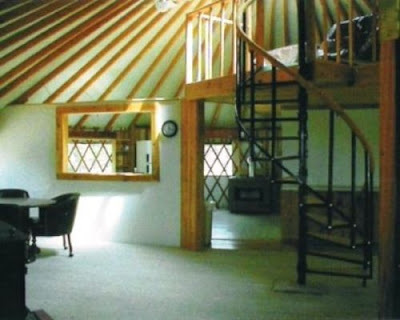 I like the tree house idea, but the Yurt is probably more practical in this situation, for the 6 months. 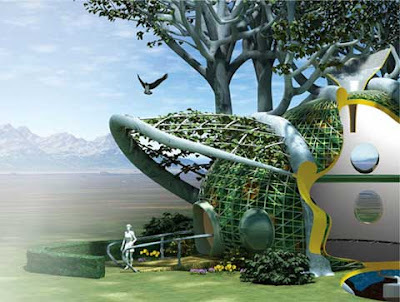 The tree house can be built later, or during your 6 month stay. On a side note, love the shot of the double rainbow over the Dome house in the last picture. 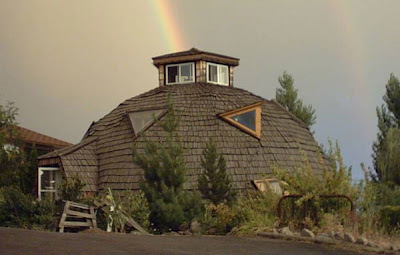 One of the kids at the school I attended in NH lived in a dome house. It was nifty, but I always wondered how they hung art on the walls. I camped this summer near a fellow with a yurt he made for himself - it looked comfy, but maybe more complicated than I'd care for on a short-term basis. I like the tree houses, especially the ones suspended from the trees like cocoons. They seem like just the thing for writing or escaping for a little while. 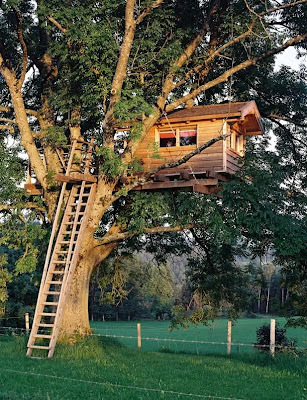 I'm a sucker for a treehouse. Lovely little sanctuary in the trees..with the birds and the bees.. Didn't I write a poem about that once? You remember that one Cyg? I LOVE YURTS...and it is my dream to own one as well on my own land...etc. etc. I have visted a place where they make & have yurts on display. It is Pacific Yurts in Cottage Grove Oregon...WOW. They also have a nice website with great photos too. I like the treehouse. I lost my land, but if I can get it back, or get another piece of land, then when it comes time to build my home there, I might look to the trees. I've thought about it before. Like the elves in LOTR. Or that kid on that television show. You know, the one with the place who did that thing.